Happy Tuesday! I hope summer is treating you well! There is still some time to enter to win one of three Kindle Paperwhites that my publisher (Skyscape) has graciously provided and loaded with all three books in the series! 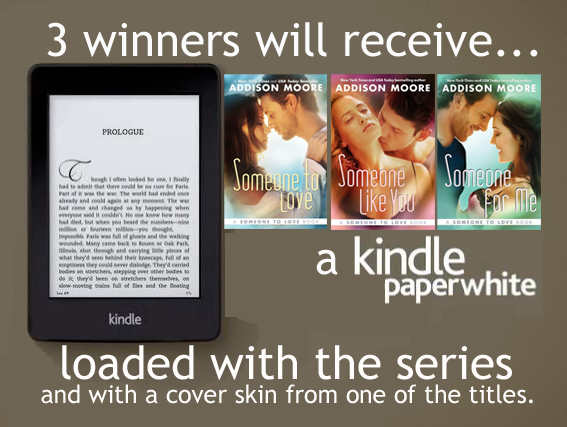 Each Kindle comes with a custom Someone to Love, Someone Like You, or Someone For Me skin. Really, it's too cool for words! Just click on the picture below to enter. Also, I don't usually post links to interviews that I've done but I was so humbled and happy to be on Kindle Love Stories: Peeking Under the Covers. Here is a sneak peek of what I had to say: Click here! My eyes flood with tears “I was wrong,” I whisper. “You own me, not the other way around.” My lips crash to his and I fold. Thank you for the chance! Best of luck to everyone! Okay first, those kindle skins are so awesome! Second, the Dragon and the Rose, teaser... so not nice! Cannot wait for that book! Donna Harms - To you, too, girl!